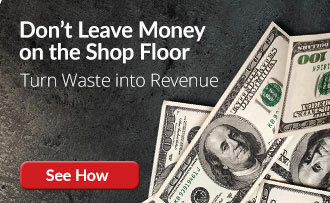 Protect your scrap removal and processing system from metal solids. 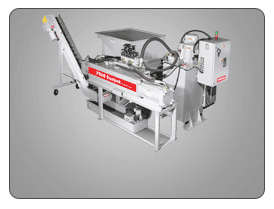 The tramp metal separator is primarily used with a PRAB Chip Processing system for removing bar-ends, broken tooling and other solids from the chip flow. This protects the scrap metal equipment from damage- reducing downtime and costly repairs. Tramp metal separators protect scrap removal systems from damage and reduce downtime by removing metal solids from the chip flow. PRAB offers a complete line of tramp metal separators and scrap removal systems to remove bar-ends, broken tooling and other solids from chip flow protecting scrap metal equipment from damage. This reduces downtime and saves money on costly repairs. The Model O is a scrap collection unit that positively separates all types of solids from material flow in preparation for scrap metal recycling. 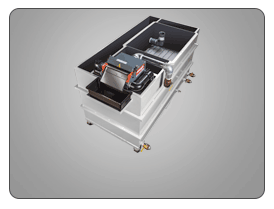 It is a heavy-duty, oscillating, conveyor-fed air classifier designed for large chip processing systems. Typical throughput of metal chips is 200 ft3/hr (5.6 m3/hr). This scrap metal equipment includes a 20 hp blower and plenum system designed to recirculate airflow, reducing misting issues. The Model V contains a vibratory feeder/air classifier that separates solids from wet chips and turnings at a rate of 100 ft3/hr (2.8 m3/hr) in preparation for scrap metal recycling. This scrap metal equipment includes a return air system that recirculates airflow, reducing misting issues. The Model G is a scrap collection unit containing a gravity-fed, free-standing air classifier that can process metal scrap at rates up to 80 ft3/hr (2.2 m3/hr). This scrap metal equipment positively separates tramp metal from material flow for scrap collection in preparation for scrap metal recycling. The unit includes a 20 hp blower and plenum system designed to recirculate air flow, reducing misting issues. 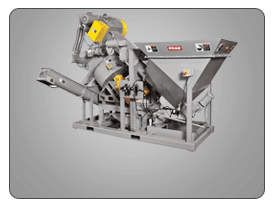 The Model R Separator is specifically designed to feed PRAB Diagonal-Shaft Wringers. This scrap collection unit incorporates a blower and rotary air lock mounting to the wringer infeed conveyor. Two adjustable plenums control air flow into the wringer infeed. The unit is capable of being “fine-tuned” to divert very small solids from the chip flow. The unit can process metal scrap continuously at rates up to 60 ft3/hr (1.6 m3/hr) in preparation for scrap metal recycling. 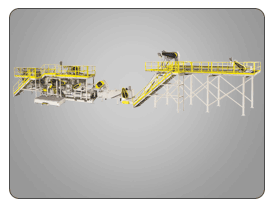 Generally used for cast-iron applications, the Model S Separator/Screener is a scrap collection unit with a vibrating bar screener deck. It can be provided as a stand-alone unit or can also be attached to the inlet of a wringer or briquetter to separate flowable chips from solids and reject castings for scrap collection in preparation for scrap metal recycling. Magnetic tramp metal separators employ high-intensity ferrite or rare earth magnets within a fully energized rotating drum to continuously remove ferrous particles from the flow of liquid. These systems are often used as a pre-filter to limit contaminants reaching subsequent filtration equipment. Typical applications include centerless and heavy stock removal grinding machines, honing, and gear cutting machinery.